UNTOLD – We dance together! Fratelli Grup proudly announces its partnership with UNTOLD Festival, 2018! For the fourth year, Fratelli Grup, organiser of the VIP Area, joins UNTOLD Festival, awarded Best Major Festival and Brand of the Year ever since its first edition back in 2015. Start making your summer plans with Fratelli for the forth edition of UNTOLD, August 2nd – 5th, in Cluj, to write new stories and enjoy great experiences! 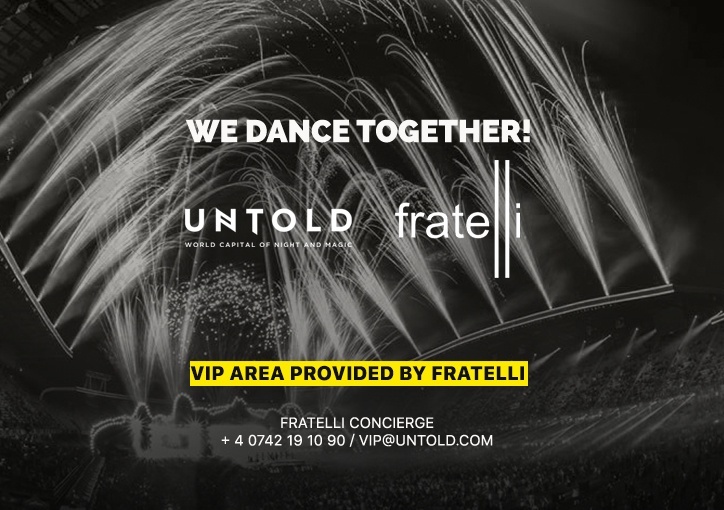 And to make it more easier, please follow our website www.fratelli.ro/news/untold to find details about several special packages prepared for your experience at UNTOLD, including VIP table reservations and a concierge service at your service 24/7. Choose your VIP package and you’re ready to go! The 4th edition of UNTOLD Festival features yet another worldly line-up, among which, just to name a few Afrojack, Armin van Buuren, Dimitri Vegas & Like Mike, The Chainsmokers, Steve Aoki, Solomun, Jamie Jones, The Prodigy, Tujamo and many more.